Mamata urged people to change their Twitter DPs into black to protest against the sudden invalidation of Rs 500 and Rs 1,000 currency notes. 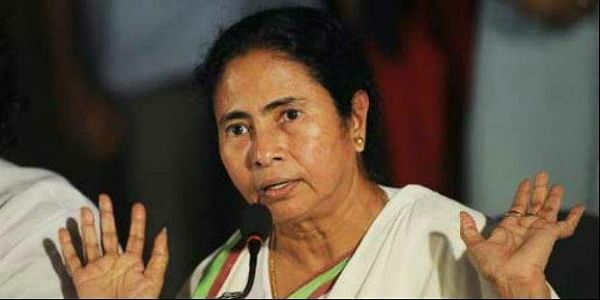 KOLKATA: Trinamool Congress supremo Mamata Banerjee launched her social media war against the Centre on Monday by urging people to change their Twitter DPs into black to protest against the sudden invalidation of Rs 500 and Rs 1,000 currency notes on November 8 last year. Banerjee was one of the first politicians to tweet against the move, calling it a ‘total disaster’ just half-an-hour after the Prime Minister’s iconic speech on November 8. She has sharpened the pitch of her attacks on the central government since then. The Trinamool Congress supremo also claimed that Centre was taking revenge against her criticism of demonetisation by using central investigating agencies to hound her after two of her party’s Lok Sabha MPs Tapas Pal and Sudip Bandopadhyay were arrested by the CBI on December 30 last year and January 3 respectively for their alleged involvement in Rose Valley scam. The West Bengal chief minister was expected to sharpen her attacks against the Narendra Modi government after it came to light that the Centre was mooting to direct National Investigation Agency (NIA) to take over the investigation of blasts, deaths and arms haul during the 104-day-long Gorkhaland agitation in Darjeeling and Kalimpong districts of West Bengal since June. In another tweet on Monday, Mamata Banerjee also fired a salvo against another controversial move of the Narendra Modi government by calling GST (Goods and Services Tax) as ‘Great Selfish Tax’. “Great Selfish Tax (GST) to harass the people. To take away jobs. To hurt businesses. To finish the economy. GoI totally failed to tackle #GST,” she tweeted. The Congress demanded a major overhaul of the Goods and Services Tax (GST), alleging that the tax reform measure turned out to be a “big disappointment” due to its “poor” implementation. The finance ministers of the Congress-ruled Punjab and Karnataka, Manpreet Badal and Krishna Gowda, alleged that the country “lost the opportunity” to bring tax reform and that there was “utter chaos and confusion” forcing many businesses to shut down.